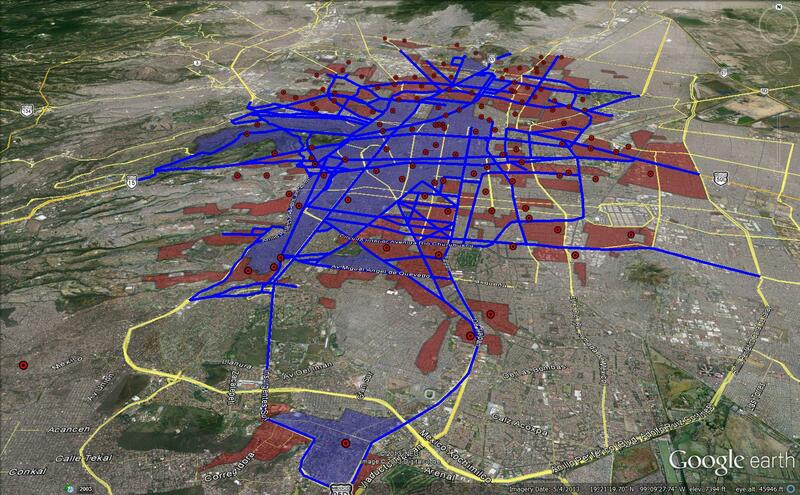 The next step in my mapmaking project on Mexico City during Uruchurtu’s tenure as regent from 1952-1966 was the addition a new data set focused on the construction of new public markets not only within the confines of the Federal District, but within the greater Mexico City metropolitan area as well. Before examining the processes by which I created this latest layer of data, a bit of historical background should be helpful. From 1953-1966, Uruchurtu and the DDF were responsible for the construction of 172 new markets containing over 52,000 individual vendor stalls at an estimated cost of more than half a billion pesos. Precise numbers for construction, renovation, and maintenance costs are very difficult to obtain from existing archival sources. However, DDF records do show that from 1953-1958, the city spent 350 million pesos renovating existing markets or constructing new ones, representing almost 8.5 percent of the total expenditures by the DDF during this period. The financial gains by the modernization of commerce in these new markets were insignificant, and such massive expenditures for the city treasury instead served as state propaganda and a guarantee of support from a new political interest group composed of comerciantes en pequeño (petty merchants). This newly formed economic and political covenant with the Frente Unico de Locatarios y Comerciantes en Pequeño del D.F. would help to reverse the PRI’s political fortunes in Mexico City, helping to boost support for the ruling party among the working classes. The openings of major markets such as La Merced, Jamaica, and Tepito were highly touted political events showcasing the commitment of the Revolution to bringing about economic equality for all. In October 1957, the opening of a massive market containing 4,488 vendor stalls in the barrio of Tepito was attended by thousands of vendors, members of Congress, senior ministers, Uruchurtu and department chiefs within the DDF, and even President Adolfo Ruiz Cortines, reportedly the first Mexican president to ever step foot, let alone hold a major political event, in this neighborhood notorious for its poverty and street crime. However, beyond the political gains which resulted from the construction of new, modern marketplaces, Uruchurtu sought to eliminate the disease, crime, and immorality which city officials associated with the “market days” or tianguis which had been a part of Mexico City’s economic and social traditions since the time of the Aztecs. These chaotic, unregulated markets were portrayed as being rife with pickpockets, dealt in black market goods, sickened residents through the sale of spoiled food, and corrupted the morality of the populace through the sale of cheap alcoholic beverages. The commercial activity created by these marketplaces spilled out of plazas into the surrounding streets of the city. Pedestrians and large trucks continually flowed past sidewalks filled with vendors’ stalls, slowing traffic to a crawl. This “cork” on the flow of buses, sanitation crews, and general commerce reportedly affected more than 530,000 square meters of the urban landscape, and according to the DDF, was analogous to an “ever-growing cancer” on the city. The destruction of these old markets and the containment of petty merchants within new, modern market buildings was a priority for the well-being of the city and its residents. Clean, modern markets complete with electric lighting, refrigeration, ventilation, an open, spacious design, childcare for vendors, and police surveillance could help to sanitize and decongest the city streets while at the same time improve the physical health of urban residents by providing them with fresh, healthy food and a safe, moral environment in which to shop for the basic necessities of life. My data set on the period from 1953-1964 contains information on 129 public markets within the metropolitan area, for which I included the names, the number of stalls, and the latitude/longitude coordinates of each market. As with the information on public lighting, this data came directly from the DDF’s own records at the Archivo Historico del Distrito Federal (AHDF) in Mexico City which I compiled during my dissertation research in the fall of 2011. However, in my attempts to locate and verify the address information provided by the DDF, a fair amount of detective work was required. The DDF data only provided the cross streets for each market’s address, a method which works fine for an address listing like Wagner y Mozart due to the unique street names. 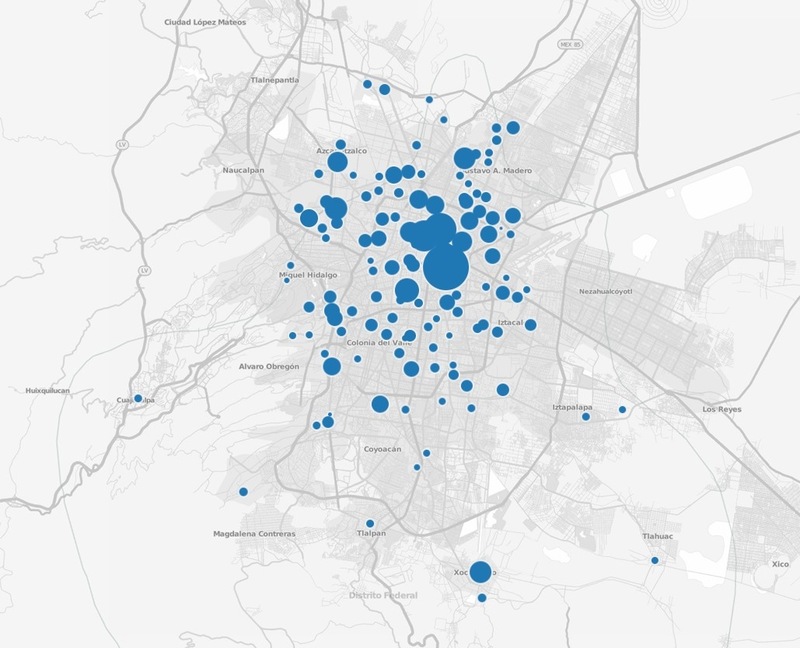 However, the ease of geographically locating a market can be dramatically different with a listing like Constitucion y Jalisco, for which there might be four or five streets named Constitucion as well as Jalisco located throughout the city. Additionally, in several cases, the address listing provided by the DDF (and sometimes the geographic marker provided by Google Maps, if there was one) was incorrect by entire city blocks. This led me to walk the city streets using Street View in Google Maps, doing some detective work until I located the market around a corner or down the street several blocks. This ability to virtually explore the city via Google was invaluable in making my map as accurate as possible and it really is a technological marvel that I can track down a public market in Mexico City from my computer at home here in Fort Collins. What would normally take a physical visit to the city and possibly asking locals for directions now can be done in minutes on a computer thousands of miles away. But I gush too much about my appreciation of all things Google. As opposed to the previous layer of data on public lighting which was composed of both linear and polygon overlays onto Google Earth, I created three separate maps each capable of representing the data in a unique way. For the first map, rendered on Google Earth, I imported my data set created in Excel into Google Fusion Tables, which then allowed me to create a .kml file which can be downloaded here. A simple upload of the .kml file to Google Earth, and the new layer was added on top of the existing layer on public lighting. This simple layer of pushpins is not very visually telling in itself, but the great thing about Google Earth is the ability for users to attach photos, videos, and links to other sites to each marked location on the map. For La Merced, one of the more famous and grandiose markets in Mexico City from this time period, I attached an image of the market’s interior just prior to its opening in the fall of 1957. Hypothetically, a group of users could collaboratively attach media and links to further information on any marked location on this map, creating an interactive, historical atlas of the city which visitors could explore location by location or via tours along preselected routes. This interactive capacity is a big selling point for Google Earth as a means of conveying a variety of information on historical locations and its ease of use makes it possible for just about anyone to create a map quickly. For the second map, I made the map pictured below using Tableau Public. As I can’t embed html directly into this blog, please click here to explore the interactive version of this map. For this visualization, I’ve linked the number of stalls attribute directly to the size of the bubble, moving beyond the simple pushpin display found on Google Maps/Earth. 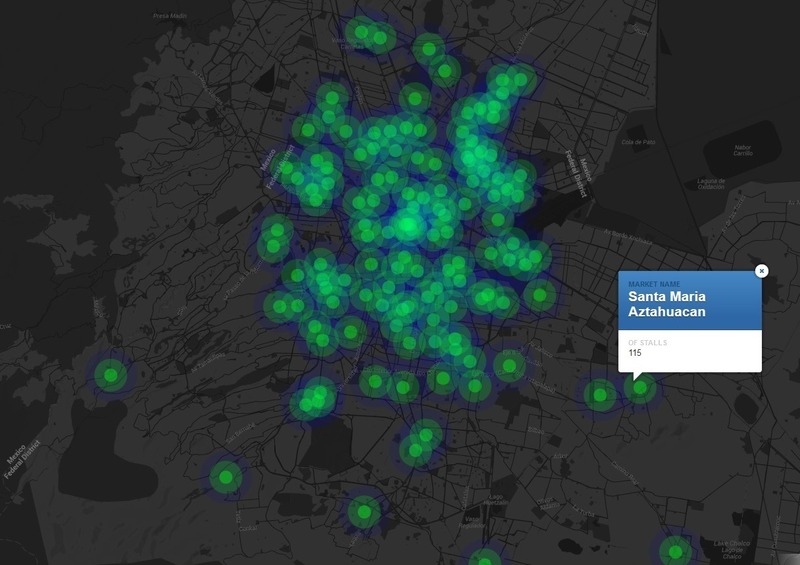 This allows the viewer to see the relative size of each market based on vendor capacity and thus get a sense of market concentration in various parts of the city. Lastly, to further analyze market concentration in various parts of the city, I used CartoDB to generate this map. Again, please do click the link to see the interactive version. This intensity map was created on my favorite basemap template, GMaps Dark (which I dearly wish other map programs had available), and uses three thermal rings surrounding each market location to emphasize the physical concentration of markets in various parts of the city. It’s not quite as striking as a true choropleth map, but I just don’t have the data sets to do something like that for Mexico City. The process of creating these three maps has been an incredible learning experience for me both technically and as a scholar, and I hope the information conveyed helps to further illuminate this period of the city’s history. My next layer of mapped data will likely be on new school construction, but first I plan to take a small break from maps to create my first network graph on Gephi. Stay tuned for that graph in the very near future and thanks to everyone for the support, advice, and encouragement during this series of projects. History Blogger · A blog about studying and teaching history.